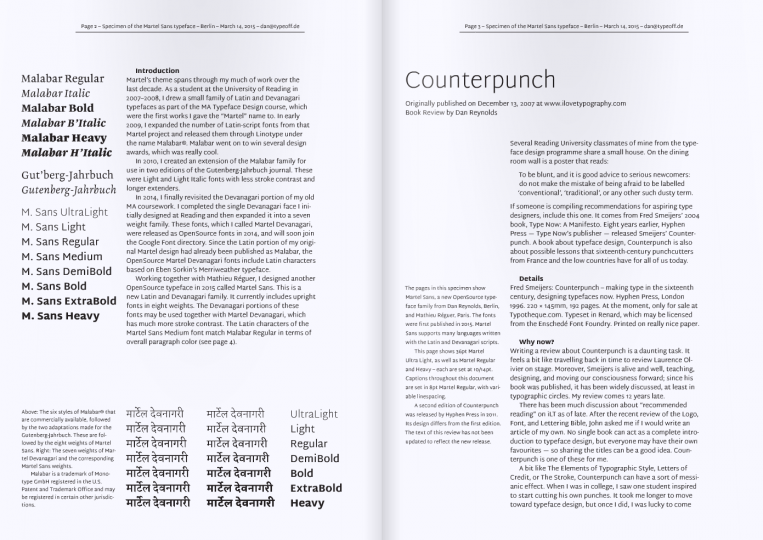 Specimen for two new typefaces — Blog — TypeOff. In late 2014 and early 2015, I worked on two Latin & Devanagari typefaces with Mathieu Réguer that you can have for free: Biryani and Martel Sans. Here are the first PDF specimen I designed for each of them; these PDFs really only illustrate the Latin-portions of those families. As for the fonts themselves, you can get the Martel Sans fonts libre and gratis from Google Fonts or GitHub. The same is the case for Biryani: Google Fonts link and GitHub link. Anyway, I hope that you enjoy looking at these PDFs. The text on most of their pages are reprints from three book reviews I wrote a few years ago. Biryani has How to be a graphic designer without loosing your soul, and Martel Sans has Counterpunch and José Mendoza y Almeida. That’s it! Hit me up with any questions over on Twitter.